Hedge fund manager John Paulson told Paulson & Co. clients that the company made more than $1 billion during the past 18 months on its investment in Citigroup (C), Bloomberg News reported, citing Paulson's letter to clients this month. Paulson benefited from a 43% jump in Citigroup's stock last year. The hedge fund sold about 83 million shares of Citigroup, or about 16% of its stake, during the third quarter of 2010, the wire service said. The biggest of Paulson's hedge funds saw its value increase as much as 18% (depending on share class) in 2010, or more than double the 7% average hedge fund return last year, Bloomberg reported, citing Paulson's letter and its own data. In all, Paulson's funds had more than $8.4 billion in 2010 gains. 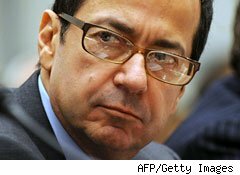 Paulson bet big on a bank that received about $45 billion in its taxpayer-funded bailout in 2009. Citigroup converted $25 billion into stock and paid back the other $20 billion in late 2009. The Treasury Department said in December that it would sell its remaining 2.4 billion common shares of Citigroup as the federal government looks to divest itself from one of its largest bank bailouts. Paulson & Co. spokesman Armel Leslie declined to comment on the letter, Bloomberg reported. Paulson was the fourth-highest-paid U.S. hedge fund manager in 2009, with his $2.3 billion in compensation trailing that of only Appaloosa Management's David Tepper, Soros Capital Management's George Soros and Renaissance Technologies' James Simons, according to AR Absolute Return.